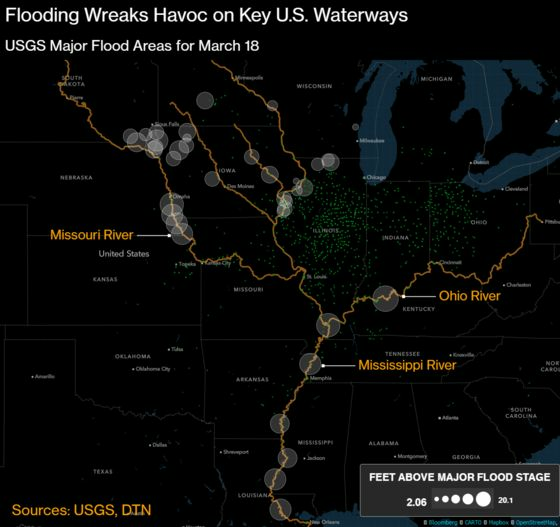 (Bloomberg) -- The Great Plains and Midwest, struggling with flooding that inundated roads and farms and pushed rivers to record heights, is set to get more rain ahead, with light showers forecast over the next few days and a heavier downpour next week. A weak rain system is expected to move through the region over the next five days, according to Don Keeney, a meteorologist with Radiant Solutions in Gaithersburg, Maryland. "But amounts will be really light,” Keeney said by telephone on Tuesday. “It is not going to add to the flooding." “It could still be messy for livestock -- the cattle won’t be happy,” John Dee, owner of Global Weather Monitoring in Michigan, said by telephone on Monday.